From: "Historic Families of America" and "The Twentieth Century Biographical Dictionary of Notable Americans: Volume IIV" and "A Naval History of the American Revolution" by Gardner W. Allen. 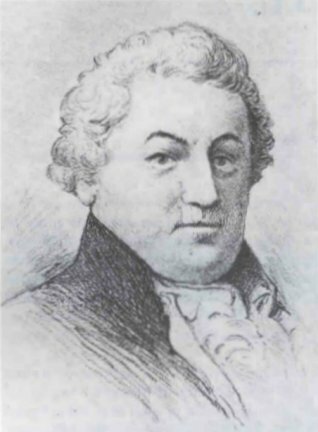 Samuel Nicholson, son of Joseph and Hannah (Smith-Scott) Nicholson, was born in Maryland in 1743. In France, Samuel Nicholson was directed by Benjamin Franklin, January 26, 1777, "to proceed to Boulogne (France) and there purchase, on as good terms as possible, a cutter suitable for the purpose of being sent to America. . . . Should you miss of one at Boulogne, proceed to Calais and pursue the same directions. If you fail there, pass to Dover or Deal and employ a person there to make the purchase." (Wharton, ii, 254.) In pursuance of these instructions Nicholson got to England before meeting with success. Being in London he wrote to Captain Joseph Hynson, February 9, 1777: "I came to town 12 O' Clock last Night, my Business are of such a nature wont bare puttg to Paper. Shall say nothing more, but expect to see you Immediately. I shall leave Town early the Morrow Morning, therefore begg You will not loose A Minutes time in Coming here, as I have business of Importance for you, wch must be transacted this Day." (Stevens, 9.) A week later Nicholson and Hynson were in Dover together and there evidently purchased a cutter, which was called the DOLPHIN and was to be used as a packet. February 17, Nicholson took command of the DOLPHIN and sailed her over to Calais. The American Commissioners in Paris endeavored to carry out the instructions of Congress, which called for ships of the line and other vessels to be built, purchased, or hired in France, but met with difficulties. The French government positively refused to sell or loan eight ships of the line, on the ground that they could not be spared from their navy, as the possibility of trouble with England made any reduction of their defensive force inadmissible at that time. This was a great disappointment, as it had been confidently believed that the British blockade of the American coast could be successfully broken by these heavy ships together with the thirteen Continental frigates, all of which it was hoped would soon be at sea. The project was formed of procuring three ships in Sweden, of fifty or sixty guns each, but no move appears to have been made to carry it through. In addition to purchasing and fitting out the DOLPHIN and SURPRISE, whose service was very temporary, and the REVENGE, the commissioners provided for three larger vessels during the year 1777. A frigate was built at Nantes, of five hundred and fifty tons and designed to carry twenty-four twelve-pounders, eight fours, and two sixes. This vessel was called the DEANE, and when finished was commanded by Captain Samuel Nicholson. In 1782, under the command of Captain Nicholson, the frigate DEANE was successful in taking many prizes from the enemy. The DEANE eventually returned to the Atlantic Coast of America where Samuel Nicholson sailed in a squadron together with the TRUMBULL captained by his olde brother, James Nicholson. At one point, Samuel Nicholson took a leave of absence from the DEANE and returned to Philadelphia. In his absence, temporary command of the DEANE was given to his younger brother, John Nicholson. Again under the command of Captain Samuel Nicholson, the DEANE sailed again in the spring of 1782. After the return of the DEANE from her cruise, Captain Nicholson was relieved of his command, for what reason is not clear; he was tried by a court martial in September, 1783, and honorably acquitted. When the United States Navy was reorganized in June, 1794, he was retained as captain and was the first commander of the frigate CONSTITUTION ("Old Ironsides") which was built after his design. Later, he was Commandant of the Charlestown, Massachusetts, Navy Yard and died at that post December 29, 1813, being then the senior officer of the Navy. Samuel Nicholson is buried in the crypt of the Old North Church in Boston. The President of the United States, having ordered the Captain and Commander of the good Frigate Constitution, of 44 guns, now riding in the harbor of Boston, to employ the most vigorous exertions to put said ship, as speedily as possible, in a situation to sail at the shortest command. Notice is hereby given, That a HOUSE OF RENDEZVOUS is opened at the sign of the Federal Eagle, kept by Mrs. BROADERS, in Fore-street; - where ONE HUNDRED and FIFTY able Seamen, and NINETY-FIVE ordinary Seamen, will have an opportunity of entering into the service of their country for One Year, unless sooner discharged by the President of the United States. --To all able bodied Seamen, the sum of SEVENTEEN DOLLARS; and to all ORDINARY SEAMEN the sum of TEN DOLLARS per month, will be given; and two months advance will be paid by the Recruiting Officer, if necessary. None will be allowed to enter this honorable service, but such as are well organized, healthy and robust; and free from scorbutic and consumptive affections. A glorious opportunity now presents to the brave and hardy Seamen of New-England, to enter the service of their country--to avenge its wrongs--and to protect its rights on the ocean. Those brave Lads, are now invited to repair to the FLAG of the Constitution now flying at the above rendezvous; where they shall be kindly received, handsomely entertained, and may enter into immediate pay. Commander, United States Frigate Constitution. At the above rendezvous Lt. Clark of the Mariners, will enlist three Sargeants, three Corporals, one Armourer, one Drummer, one Fifer, and fifty privates to compose a company of the Ship Constitution. None can be enlisted who are not five feet, six inches high. 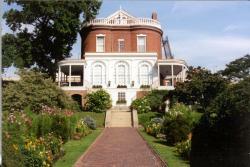 The residence for the commanding officer of the Charlestown Navy Yard, Captain Samuel Nicholson, was finished in 1805. This grand and spacious house is located on the top of a small hill overlooking the Navy Yard with a panoramic view of Boston Harbor and Boston's skyline. Nicholson was the first captain of the USS Constitution (Old Ironsides) in 1797. The Commandants house is one of the oldest buildings in the Charlestown Navy Yard and has served as both a private home and public place for more than 170 years.